A training project run by Yunnan Agricultural University and funded by the United Nations is using heritage to provide economic sustenance. Dorlma, a Tibetan woman who learned weaving from her family as a teenager, is now helping her family even more, thanks to a United Nations-funded training project on producing Tibetan carpets run by Yunnan Agricultural University. So, now, while her husband works as a day laborer, the main income of the family comes from her weaving Tibetan carpets and separately selling handmade blankets, clothes and home ornaments, something she used to do earlier. Speaking about the training, her first professional course in Tibetan carpet weaving, Dorlma says: "I was very thrilled to see the teacher weave carpets at the course. And I immediately learned the different patterns the teacher demonstrated, and really hope to further improve my weaving skills." Dorlma is one of the beneficiaries of a project funded by the UN China Gender Fund for Research and Advocacy, which offers courses to women in Dechen county in the Dechen Tibet autonomous prefecture in Yunnan province. The project - run by the Institute of New Rural Development at Yunnan Agricultural University, which began in last November - targets Tibetan women in Yunnan, and is expected to run through June 2019. One of the main aims of the project is to find ways to encourage women's participation in community activities, and to increase the income of the migrant families. The project that was devised by Du Fachun, the associate dean of the Institute of New Rural Development, was one of the seven ideas picked in 2017 for funding by UN-China Gender Fund 8th Batch Projects. Speaking about the Yunnan university project, Ma Leijun, an officer from UN Woman China, says: "The UN pays special attention to the development of ethnic minority regions, especially the development of women. And as this project is concerned with the development of ethnic women, it met our selection criteria last year. It is also fairly mature in its project design, impact estimation and other submitted materials." 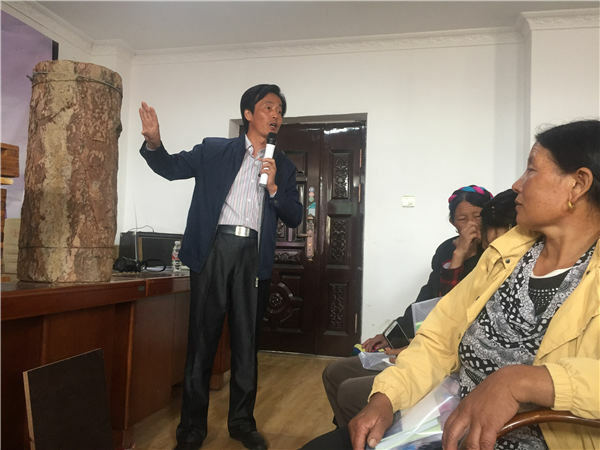 Meanwhile, the training courses, co-hosted by UN Women China, the Dechen Prefecture Women's Federation and the university, are based on research by the institute on the eco-migration areas of Dechen county. "Most of the women attending the training moved to this place due to environmental issues or government mass relocation programs aimed at poverty alleviation," says Du. "Also, most of the families live on state subsidies and face economic pressure due to a lack of regular income. Therefore, these women support their families by engaging in traditional industries." Among the traditional industries the local women participate in are Tibetan carpet weaving and bee-keeping, according to an initial report of the project. The report also shows that many locals feel that the government should devote more effort to promote these two industries. 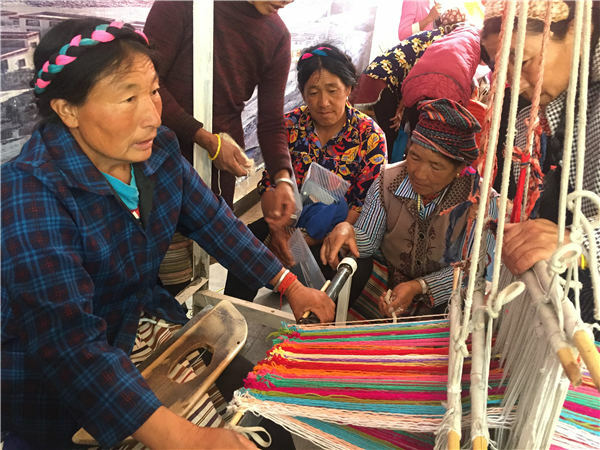 Giving her view on the courses, Sun Hongmei, the president of the Women's Federation of Dechen county, says: "The majority of those who attended the carpet-weaving course had a background in weaving. Also, the textile products they weave not only satisfy household use, but also help support the family. Besides, the weaving of carpets is not limited by time or space, and is easy to learn." Another reason why Tibetan carpet-weaving is being promoted is to preserve the traditional handicraft. With the relocation, the locals no longer need Tibetan carpets to protect themselves from the cold, which led to the gradual decline of this traditional craft. "With modern machines and practices brought in by experts from different regions, the traditional handicraft is seeing innovation," Du says. Separately, another training course on beekeeping is being offered to the locals in Yangla township, located in the northeastern part of Dechen county, where over 90 percent of the residents are involved in the industry. Before starting the course, the experts who were to run it visited farmers in Jiagong village and researched beekeeping methods there. And they found that Yangla township has an ideal environment and strong potential for bee-keeping, but there was a lack of technological support, management methods, and funding. Of the 42 participants selected for the first course, more than half were female, consistent with the aims of the UN program. Commenting on the male-female balance, Ma says: "In our overseas projects, we require a certain number of male participants, so as to break gender conventions. As for the response from the community, Sun says the villagers are happy with the courses. "The training has fueled the people's enthusiasm. Everyone seems interested and motivated." The CGF, established in 2004 by the United Nations Theme Group on Gender, works on empowering women and reducing gender inequality in China, by offering financial support to a wide range of projects. Speaking about the implications of this project, Ma says, "It shows me the importance of offering training to women. The ecology of this region is also worth taking into account."